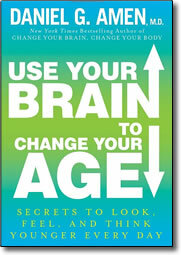 Use Your Brain to Change Your Age – Paperback by Daniel G. Amen – Discount! A healthy brain is the key to staying vibrant and alive for a long time, and in Use Your Brain to Change Your Age, bestselling author and brain expert Dr. Daniel G. Amen shares ten simple steps to boost your brain to help you live longer, look younger, and dramatically decrease your risk for Alzheimer’s disease. Over the last twenty years at Amen Clinics, Dr. Amen has performed more than 70,000 brain scans on patients from ninety different countries. His brain imaging work has taught him that our brains typically become less active with age and we become more vulnerable to memory problems and depression. Yet, one of the most exciting lessons he has learned is that with a little forethought and a brain-smart plan, you can slow, or even reverse, the aging process in the brain. By adopting the brain healthy strategies detailed in Use Your Brain to Change Your Age, you can outsmart your genes, put the brakes on aging, and even reverse the aging process. If you change your brain, you can change your life—and your age.